Fresh and fruity on the nose with apples and juicy, ripe pears. This is followed by lingering vanilla and a whiff of oak in the background. Sweet, creamy and fruity on the palate at first, but then a warming spiciness of white pepper and caramelised ginger emerges. Once this warmth fades creamy notes of vanilla and malted barley arrive, lingering with sticky pear fruit towards the finish. A long, warm and creamy finish. The fruits are getting darker, mixed with subtle cocoa, slightly bitter orange peel and a hint of dry oak on the tail. Quite fresh and fruity on the nose when a few drops of water are added. There's more oak coming through, mixed with a touch of bitter orange peel. Very sweet and creamy on the palate, even velvety. Sticky fruit jam mixed with a slightly warming spiciness of white pepper, along with malted barley and cereal notes. The finish is a bit shorter, stays creamy with sticky apricot jam and a whiff of cocoa on the tail. The slightly greenish colour of this single cask bottling must not cause any uncertainty. 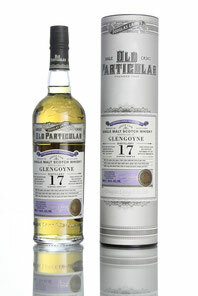 Behind it there's a delicious, sweet-fruity single malt with a intensly warming, spicy note and a creamy, long finish. This shows again that Glengoyne does not always have to bottled from sherry casks.